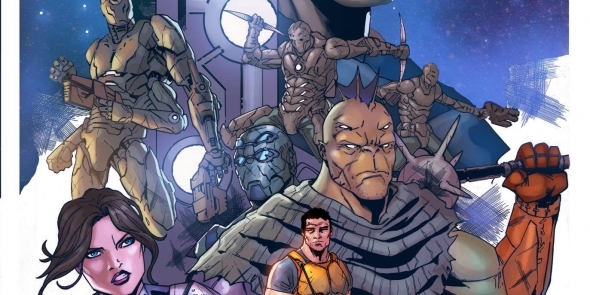 In the first four book volume of Salvagers: The Wreck Raiders, we are introduced to the intense sci-fi world that Bob Salley has created with Salvagers. Published by Source Point Press, the series is set in the distant future, and the story follows a crew of “Salvagers”, which are spaceship crews that travel throughout the galaxy searching for abandoned ships and stations in order to retrieve anything left behind that may be valuable in order to sell them to those in need. Though these types of teams are commissioned and sanctioned by the government, that does not mean there are no risks involved. The team, consisting of their captain, surly, jaded Bill Roenik, Ty’r, resident muscle of the group, the member I would consider the heart of the group, Pilot and Operations Officer, Teagan, and my favorite character, the small, lizard like tech specialist Brigby, who is always seeming to find himself in one mess after another is a wonderful, memorable cast that I think will be able to draw in and hold the attention of readers immediately. Volume one did a fantastic job of introducing and allowing us to get to know each character very well as well creating a universe that readers would certainly become heavily invested in. With volume two, both the characters and the universe were expanded upon in such a way that I believe those who appreciated the first volume will be highly immersed and satisfied with the way things were developed in volume two. Packed with action and violence, but laced with humor, Salley’s writing style certainly work for the series, making it fun, interesting and fresh. I really appreciate the way he has taken his time exploring personalities and backstories of each character; it is clear that he put a lot of time and effort into creating memorable characters and a story that will certainly stick out to those reading it. As a bit of a sci-fi geek myself, I found myself reminiscing and rekindling my love for Joss Whedon’s Firefly while reading Salvagers, and I definitely have to wonder if Salley himself is also a fan. There is something really special being developed in Salvagers, as it is both dirty and gruff, but also has a lot of emotion and depth to it, and I think that is something that truly sets this book aside from a lot of sci-fi style pieces. Volume two was full of characters and new plotlines which seem to be setting up something huge for the upcoming volume three. We are given hints and tastes of a bigger picture in this universe, but volume two surely leaves us with some unanswered questions, which I can doubtlessly say will be leaving readers anxious for more. The largest and most obvious change I found when I picked up volume two was that there was a new artist on board, replacing George Acevedo. Chris Genevois is the credited artist for volume two and his work and talent is noticeably different from Acevedo’s. I fell in love with Acevedo’s detailed line work, heavy shading and overall unique approach to comic art in volume one. The art spoke to the gruff, gritty nature of the stories and characters and for me it just worked perfectly with the book. I actually ended up reading both volumes back to back, so when I began volume two, I was quite surprised, as it had a significantly different feel to it. When I began volume two, I would be lying if I said that I did not question the choice to replace artists and originally did struggle trying to figure out if it worked as well as the prior volume. That being said, I think I just am someone who immediately objects to change, as Gevenois’s artistic hand did end up truly shining. Focused strongly on attention to detail, particularly with the costumes and surroundings, the art in Salvagers: Volume Two adds an extra level of old school science fiction to the title. Whereas the previous art may have showcased the more gritty nature of the book, the art in volume two focuses more on characterization and developing a universe that is notable and beautiful. In an issue that has so much going on in it, new plotlines, new characters, the expressive yet simplistic take that Genevois has brought to volume two just simply works. The second volume of Salvagers kept the momentum of volume one going and certainly upped the pace and set the scene for a future volume three, which Salley did recently tell me is currently in production and there is a Kickstarter campaign slated for release on May 1st for it. Volume two will be available on the Source Point Press website in May. I definitely look forward to seeing just where this story is going, as well as getting to know some of the characters introduced in this volume even more in further issues.